If you have a motorcycle, today is the day to fire it up and ride to work. It’s International Ride to Work Day today, which is the third Monday in June. More information can be found at www.ridetowork.org. Don’t let that purported 50% chance of thunderstorms stop you – get out and ride! I’ll be doing so too! I won’t be racing, like I was in the photo above but I sure do enjoy getting the fresh air on the way to and from the office! 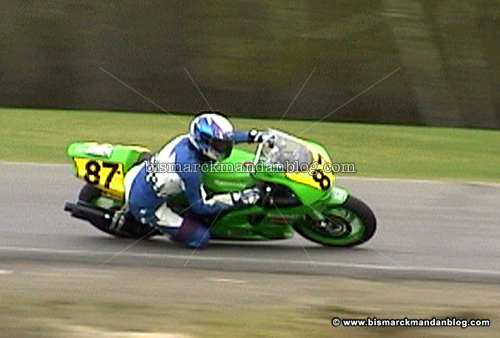 And we’ll see about getting back into roadracing again some day. Just don’t tell my wife. Over the course of the weekend I went from couch pilot to two-wheeled pilot back to couch pilot. I’m fighting a nasty head cold (no, not swine flu) and took Friday off. Saturday I felt better so I helped my wife get the garden and yard into shape, which turned out to be the wrong thing to do. So today saw me in as equally rough shape as Friday for most of the day. I used to be one of those guys who had to ride all the time. I rode every month of the year, including ice racing. Nowadays I’m busy being husband and Daddy as well as having hobby overload. Besides, the roads right now are absolutely AWFUL. There’s still lots of sand and gravel out there, and the potholes & cracks are everywhere. Because of this I’m satisfied to wait before ramping up the riding season. 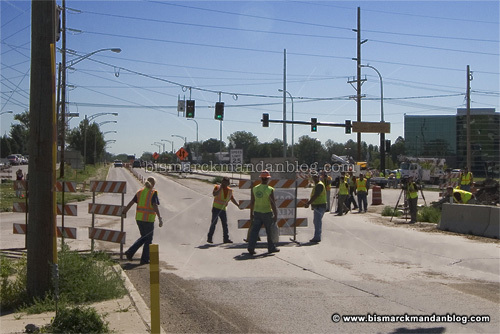 I don’t mean to imply that the city isn’t taking care of the roads to the best of their ability; after all, they’re only finishing up the aftermath of the flood fight…this after a record winter. The weather has subjected the roads in our area to abnormal stresses and it’s going to be a while before crews can give the roads the attention they require. Add to the fact that the problems are everywhere and you have a long, drawn out repair season. 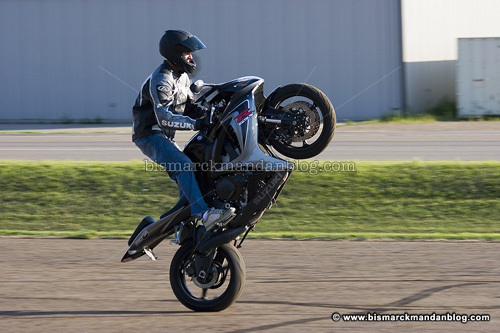 I have seen a lot of motorcycles out, especially young guys on the sportbikes. I understand the itch to ride ’em. This seasoned sportbiker, however, has put in enough years as a gung-ho kid to know when it’s time to hold off a bit to avoid bending wheels or sandblasting the bottom of the bike. I’ll be out with my dirt bikes or my camera for a while instead. That’s right. 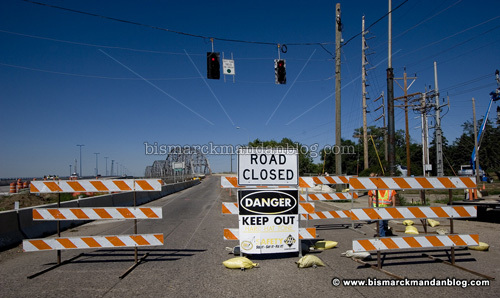 As a big proponent of motorcycling in North Dakota, I’m pretty happy to say that a motorcycle closed the books on “civilian” travel over our beloved bridge. If I may digress for a moment, I’d like to point out that this bridge was scary/fun back on a motorcycle back when it had the metal deck! Not only could a rider look straight below and see the water, but the gridwork made motorcycle tires “swim” back and forth in a manner most discomforting at first. Digression aside, those fine folks in the picture above were blocking off public traffic on this bridge forever. Maybe they sensed that I am a former DOT employee, maybe they were just being polite…in any case, they allowed me to park my motorcycle off to the side and wait to be the last guy across. Someone in a white Ford Thunderbird actually got in behind me after I took off across the bridge from the Bismarck side. At that point I thought I’d missed my chance to be the last person across the bridge, and resigned myself to simply being the last motorcycle across. But an idea struck as I reached the Mandan side: turn around. Not only did I want to take more pictures, but I had to get back to work! I’m very busy and didn’t have a very long lunch break. So, when I got to the Mandan side, I did a quick U-turn and headed back. That made me the last motorcycle and last vehicle to cross. 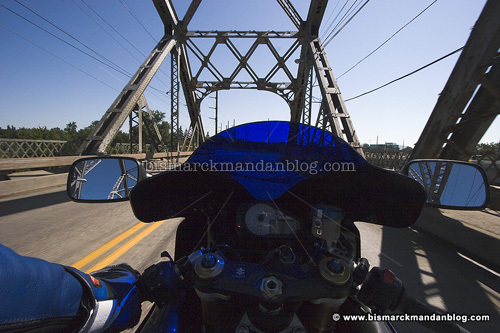 This is what it looks like to have the Memorial Bridge all to yourself…that is, if you’re on a customized Suzuki with a camera hanging around your neck. This will live on as my last view of the bridge I’ve known all my life, even when I was living in Montana as a kid and looked forward to the “humming bridge” when we’d come to Bismarck to visit family. My sources tell me that someone called KFYR-TV after their newscast to complain that he was the last guy across. That would have to have been either the person behind me in the white car, or the last person to come across from the Mandan side (before I did my u-turn). In any case, nobody came across from the Bismarck side after the white car and I, and nobody came across from the Mandan side after I did. I know because I sat at the red light on the east end of the bridge for what seemed forever, since I was wearing leather riding gear and was very hot. Nobody came up behind me. Sorry, whoever you are…the reports are accurate. Farewell, beloved bridge. I’m glad I got to say goodbye. Just as I got to drive on the Expressway Bridge shortly after it opened (I had my permit, my mom let me drive) I got to ride on this bridge right before it closed. I know, it’s odd to be so sentimental about local landmarks…but what can I say? 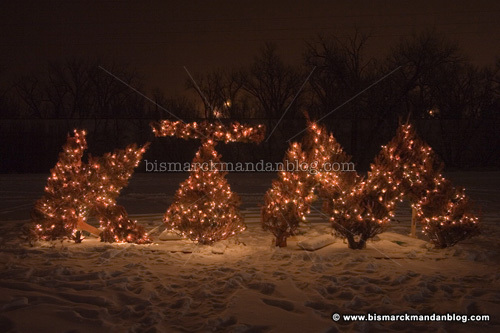 I love Bismarck-Mandan. I always have. That’s why I started this website in the first place. I’m just thankful that I have a camera and can run around after things like this. It’s cool to document Bismarck-Mandan history and provide a viewpoint for the record. By the way, I noted again today that Brad Feldman seems to have the same sort of sentimentality for our town. I really like his Around Town segments on KX news, as well as his knack for local information. I could tell from the tone of his report on the bridge closing on tonight’s news. It’s cool to see someone who has a love of their community and what’s going on here. Hopefully people who read my ramblings here will catch that sentimentality, then things like this bridge closing will seem a little more significant. Some call it a brakestand, some call it an endo, but it could simply be called entertainment. Or talent, as Jason Britton is in town. He’s hanging out with the folks at Cycle Hutt over the 4th, giving tips to riders and performing Saturday at 1:30pm in Cycle Hutt’s giant lot on the Strip in Mandan. He’ll also be taking part in the Hutt’s parade float Friday morning, so don’t forget to keep an eye out for the flashy green Kawasaki! Then hop on something with two wheels and head over to Cycle Hutt for the 1:30 performance and some fun that will last throughout the night. 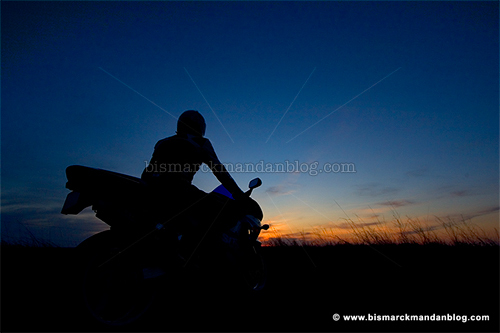 Anyone on a motorcycle will be invited to hang out and watch the fireworks after dark. There was a lot going on at the Hutt today, too…I have hundreds of photos of course, which I’ll post in due time. There was free pizza and Dew, so I was pretty much in heaven; pizza, Dew, sportbikes, and photography. Wow! Don’t forget to take part in the festivities at Cycle Hutt! 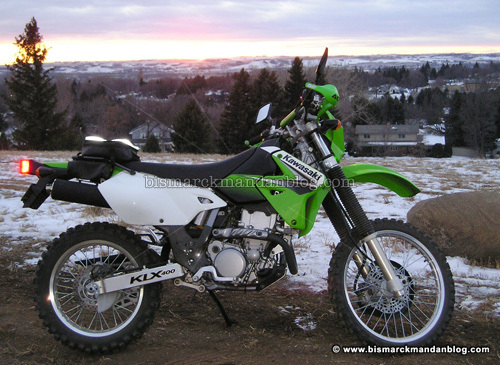 They’ve really gone out of their way to do something fantastic for fans of sport motorcycles in Bismarck-Mandan. I’m not saying where this bike sits, other than that it’s locked to the side of a house. I don’t now its particular make or model, either, but the handlebars and rear sprocket look a lot like a early 1900s Harley-Davidson® (HD’s lawyers want that ® in there). This reminds me of a common misconception among cagers (car drivers) about motorcycle reliability. For some reason there’s an idea out there that 10,000 miles is a lot for a motorcycle. Perhaps it’s because North Dakotans don’t get to ride theirs as much, or maybe it was just something that has passed along from one uninformed non-biker to another. Maybe it came from those old AMF Harleys, I don’t know. But it ain’t true, folks. I know people who have put lots of miles on motorcycles, even surpassing the 100,000 mile mark for some of them. All that’s required is simple maintenance. 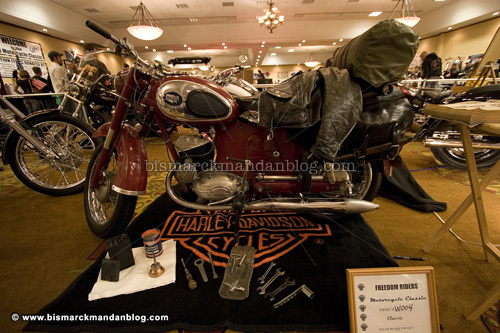 The fact of the matter is that a properly maintained motorcycle will run nearly forever; however, many motorcycles are simply neglected to death. 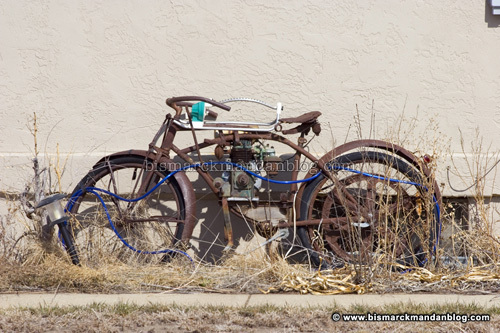 If you sat a brand new 2008 motorcycle out in the sun next to your shed and left it there, it would deteriorate just like any mid-70s enduro that you might see decaying in a trailer park along your daily commute. Cars left to sit soon rot as well, and even a house deprived of residents will soon fade and begin to lean. Everything needs reasonable maintenance. As far as the relic in the picture above goes, I bet it would have some value with the rust buffed off. I can’t help but be really curious as to its make and origin. If I ever have some spare time again in this lifetime, perhaps I’ll compare it to some photos of vintage 1900-1910 motorcycles. Its true identity could be surprising, maybe even to its owner. No, this guy didn’t crash. Even if he would, this bike is set up with crash bars ( the Harley guys call them “whiskey bars” ) and other equipment to protect vital parts when dropped. 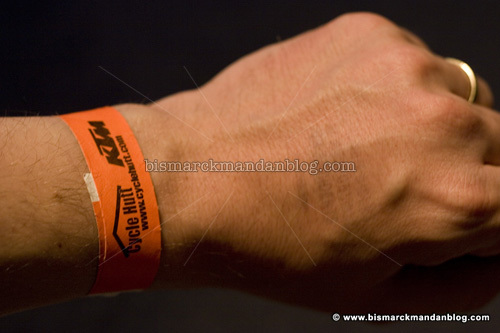 This photo is from Cycle Hutt’s monthly Stunt Night. But when I decided to title this post “Nice save” I wasn’t talking about this stunter; I was talking about my Saturday. After plugging a few targets at the handgun range I decided to stop in on the Freedom Riders motorcycle show at the Ramkota. Sadly, alcohol is mostly what there was to see. After I braved the nasty cigarette smoke to get into the Ramkota, it seemed like everyone had a beer or whiskey in their hand. Beer sponsors, beer logos, and a beer in every hand. Boy, that sure does a great job of presenting motorcycling’s image to the community, doesn’t it? 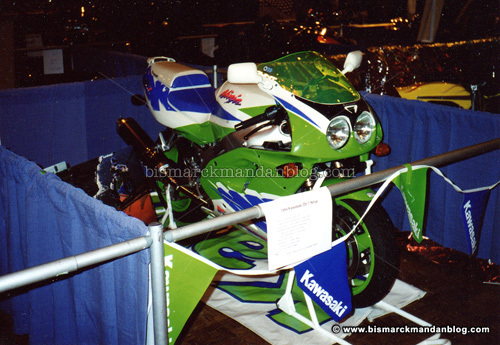 Back in the 90s I was part of trying to help sportbike riders get involved in the show, so it wasn’t 100% Harleys. After a couple of years of working hard on a display only to have some biker’s old Z-1 with candy apple paint take the Sport/Street category, I gave up. 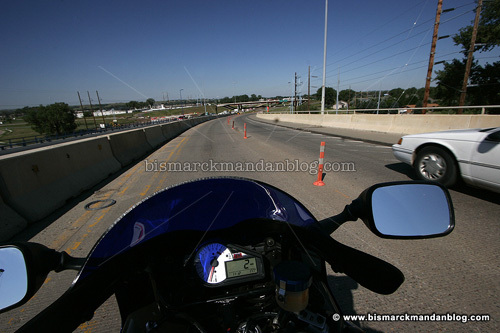 In recent years a few sportbike riders have entered their bikes, so I wanted to see what there was to see. There wasn’t a sportbike to be found. I’d heard rumblings and grumblings at a parts counter or two about the same issues I’d experienced, and apparently the sportbike guys had thrown their hands up on the Freedom Riders show. There was seven bucks (!) and twenty minutes of my life I wasn’t going to get back. I decided to make the most of it and eyeball some cool antique entries, such as this one, and then make my hasty exit back through the wall of smoke. This was the one bright spot of the show, aside from seeing a couple of friends from local dealerships. This was a petition signing point for Americans for Prosperity, which is a grassroots organization pushing for tax cuts. I signed the petition, chatted with the folks involved, and took off. Note the beer sign on the wall and the beer on the table, which didn’t belong to the AFP folks. I meant to visit the 50th annual Mandan Art Show, but by the time I got to the Mandan Community Center, the doors were locked! Argh. I was feeling pretty down about the nosedive my Saturday was taking, until I drove past Cycle Hutt. Quite a few sportbike riders were gathered for this event, and there were a few guys performing wheelies and other assorted stunts. Redemption! I pulled in to enjoy the atmosphere for a little while and take some pictures as well. This was a great opportunity to play with my ultra-wide lens, because the distortion effects it gives are pretty cool. The only trick is getting close enough. 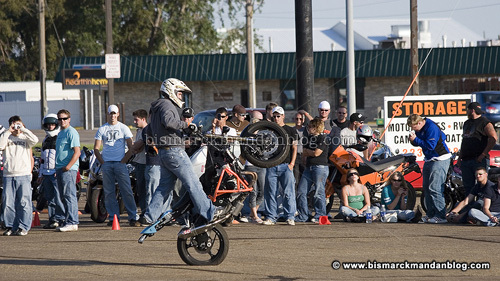 I don’t want to distract the riders, and I also don’t want to get hit if a stunt goes wrong. Everything worked out okay, however. I got a ton of photos, some of them even turned out! I don’t do much action photography, so it was a good exercise. So the rubber stamp on my hand cost me $7 and got me a look at a bunch of people drinking and a bunch of bikes with skulls and other garbage airbrushed on them. The best one I heard it called was a “Costume party” because of all the folks throwing on leather and playing “bad biker” for the weekend. It was like walking into a bar that happens to have a bunch of Harleys parked on the floor. The band on my wrist was free, I got to see a bunch of sober people having a good time, and take some wild photos to boot. Nice save. After a fun afternoon of Christmas frivolity, my wife remembered that I’d made a comment about riding motorcycle today. She suggested that I do so, and I didn’t need any arm twisting. 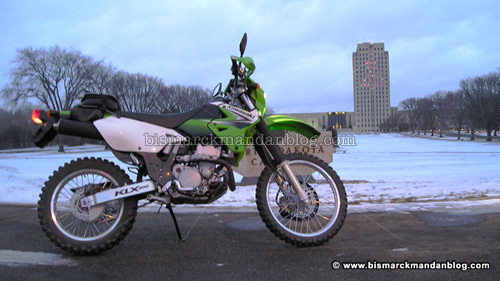 Rather than get a sportbike wet and dirty, I decided to grab something with knobby tires. By the way, knobbies do NOT work on ice. I got it pretty loose a couple of times, but that’s all part of the fun. Here’s the view from atop Tom O’Leary hill. There were some kids snowboarding when I rolled up. I had my crappy Olympus camera with me, not my nice Canon SLR, so I wasn’t able to do any really challenging shots. It was just nice to be able to enjoy a ride on my summer toy while the kids on the hill were able to enjoy riding their winter toys. We had quite a sunset tonight, too…I think everyone on that hill got some enjoyment out of it. After running into a friend of mine from Madison, Wisconsin at the intersection of Avenue C and Griffin Street (no, not literally running into) and sharing a discussion about how nobody has sunsets like North Dakota, I flew down to the Memorial Bridge area to get a shot of the brilliant red sky. 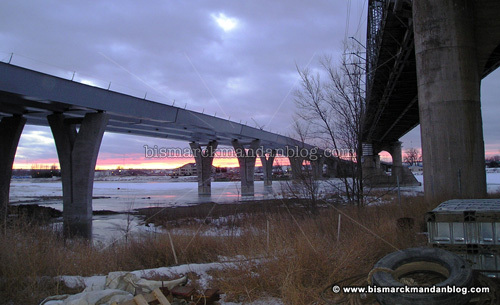 I wasn’t as fast as the sun, but there was still a little bit of a rosy glow (or pinkish hue) on the horizon as I snapped this shot beneath the Memorial Bridge(s). My prayers for a White Christmas were answered this year, and yet I was still able to ride motorcycle on Christmas day! I think we’ll call that the best of both worlds. So what did you do for Christmas? As part of Mandan’s Holiday Shop Hop, KTM Cycle Hutt offered a challenge to their 16 employees: decorate the best tree and win $1,000 in cash; 2nd place $500; 3rd place $100. To jump-start the decorating frenzy, each employee was given $250. The 16 uniquely decorated Christmas trees will be on display from December 2nd through December 28th outside KTM Cycle Hutt located on the Strip in Mandan (3700 Memorial Highway). Drive by to view the colorfully lit Christmas trees during this holiday season. If you would like to vote for your favorite Christmas tree visit www.cyclehutt.com or stop in the dealership 9 am to 9 pm weekdays, Saturday 9 am to 1 pm. through December 20th. For 2008 KTM Cycle Hutt will allow non-employee Christmas tree entries. I stopped by to visit Justin and Tammy and take some pictures, since the trees are located strategically around their giant parking lot. I thought I had a favorite tree, but I have to admit I’m stuck on two. This one depicts a motorcycle crash, one of my favorite pasttimes! There are wheels lying at the base, with fenders sticking out and even a helmet. Very cool! This fishing tree is pretty sweet too. 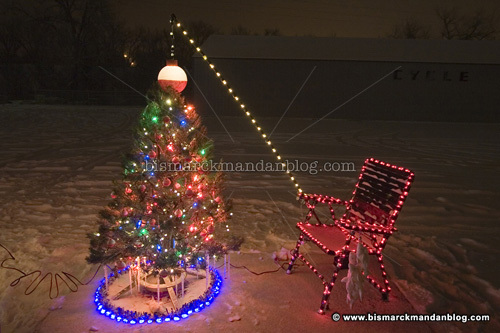 Note the frozen fish dangling from the arm of the chair! I don’t know where the bobber came from, but that’s pretty impressive as well. Very well done. You can visit Cycle Hutt on the strip in Mandan. You can’t miss the trees, which are positioned around the lot. When you drive through, please stop to take a close look at all the trees; there are some pretty cool items hanging in them to complete each tree’s theme! When you find a favorite, don’t forget to vote. 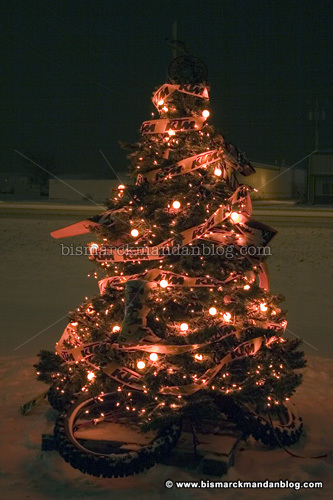 Click here to vote online for your favorite tree at KTM’s “ndracing.com” website. Cycle Hutt put their spacious new facility to use this weekend with their first (and certainly not last) Sportbike Night. They’ve got an enormous parking lot, which they made available Saturday night for wheelies, burnouts, stoppies, and whatever other sort of tricks one could do while contained within the premises. It was an enormous success! 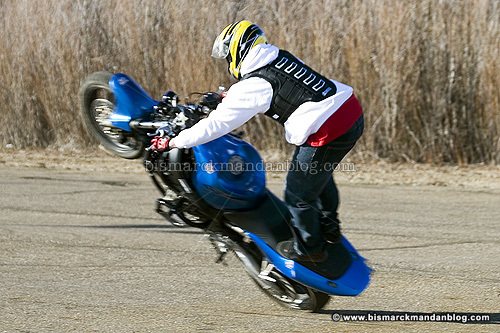 Stunters from all over western North Dakota joined in. I heard talk of guys from Dickinson and Minot who came down to take part. Amos from the 5-Oh brought his van and PA system, food was available, and everybody had a good time! Yeah, there was a crash or two, but I got there a little late and missed those. Nobody was hurt, though. Many of the bikes used have special cages welded or bolted on to prevent injury to the bike as well. 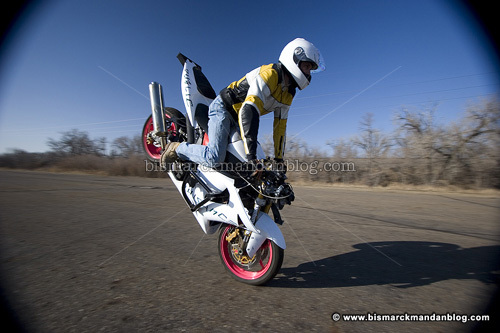 Wheelie time! This is far better than doing it on the street where it’s illegal and dangerous. An “exhibition driving” ticket is pretty expensive, too, I understand. I’ve never had one. Read the back of any speeding ticket to find out…I haven’t had one of those in seven years or so, either. Even the kids came to enjoy the fun! I didn’t bring little PJ, because I couldn’t find a way to safely transport a seven month old boy on the back of my Suzuki. He and his mommy had a birthday party to attend, so I flew solo. 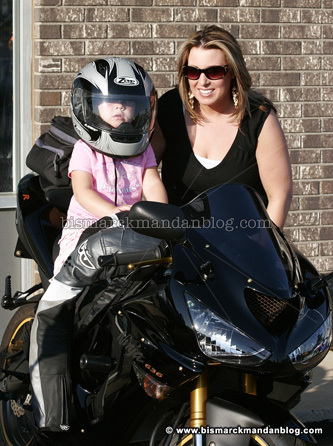 Gary’s wife brought their little girl in the car, I’m sure…but here she’s enjoying their Kawasaki in the parking lot. After things wrapped up at the shop, it was out for a group ride. Here’s the stop at Double Ditch (which has three or four ditches, actually, according to recent discoveries) Indian Village. From here many of the riders headed north on Highway 1804. Some of us ran back into town to meet up with the group later for some in-town cruising. I had a pretty serious mountain biking appointment, so that’s where I put the big Gixxer away for the evening. Kudos to Justin and Tammy, owners of Cycle Hutt, for giving area sportbike riders such a great night! Also to the guys who helped orchestrate the event. I know Amos was part of it, and I think there was another guy or two who partnered up with him. I’m sorry I don’t have your names, guys. Anyway, props to all involved – we had a blast! It’s a motorcyclist’s – or nice car owner’s – least favorite time of year: chip seal season. 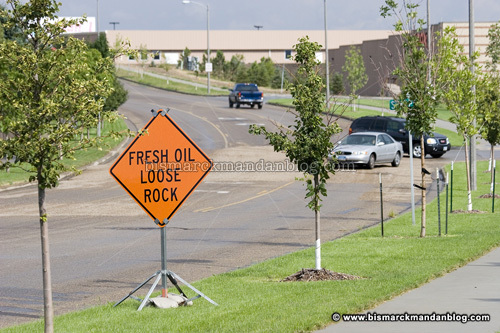 While I still consider it a dubious approach toward street maintenance, Bismarck and Mandan insist on coating the streets with gravel, spread over an adhesive layer of tar, on all city roads. Doing so means a portion of the summer where we must dodge patches of loose gravel on the roadways, at least until they come by to sweep up the excess. Last year I made a passioned plea to the Bismarck City Commission to re-examine their policies regarding chip seal application. In the 90’s I had a nasty encounter with this stuff, spread SIX INCHES deep, in a corner that was not only unlit, but at the crest of a hill as well. I still bear nasty scars from that instance, and even some ground-down bones as well. I was leading a group of riders who all had passengers, but thankfully they saw me hit the gravel and were just that little bit more prepared for it. I was also the only one decked out in safety apparel, although falling on chip seal is like falling on a meat grinder! Thankfully, we had a nurse, a doctor, and a surgical technician among us that night…it was quite nasty. Back to the point. After last year’s City Commission meeting, I was approached by Keith Hunke. For those of you who don’t know, he’s from the Public Works department. He was interested in what I had to say and agreed with the Commissioners that a better job of signage could be done. I think he’s kept his word; I’ve seen plenty of signs this year, and they look brand new. I also understand that it’s not always possible to mark every patch of chip seal from every possible approach. With that in mind, I’m throwing Keith and the Commission a big thumbs-up for the effort to make our streets safer during this construction period.